QuickJet® uses a classic HP ink cartridge that can be purchased anywhere and requires no specific ink tank. This primary difference in design makes the client user not “locked in a proprietary system” requiring a source of ink supply. 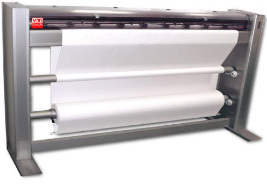 The QuickJet® plotter is based on a simple technology that feeds (unwind) and receives (winding) paper from the front, fixed on motorized rollers ensuring a consistent print quality from the beginning to the end. at the end of the paper roll.